Sparks flew the moment Mark and Kimberely over 14 years ago and their wedding day was blissfully the same. Both literal and figurative fireworks were flying the moment the pair tied the knot at their lush Gabbinbar Homestead wedding. The loved-up couple first crossed paths at one of Mark’s family Christmas events. Kimberely had tagged along with her sister who was dating his Brother Greg. Many years later her sister Dani married Greg, Marks brother. The pair went on their first official date a week later and have been together ever since! After Mark proposed in 2017 they began planning their gorgeous Autumn wedding at Gabbinbar Homestead in Toowoomba. Filled with fresh whites and greens with splashes of rose gold and soft blush, Kimberely and Mark’s wedding day style could do no wrong. Both the wedding and reception venues were lined with flickering candles and bountiful overflowing florals. “Anna from Happiness is a Garden worked with me on the floral design for our ceremony and reception bringing my vision to life – it was magical. I used G&E Fisher Design to make my table numbers and laser-cut rose gold name for my guests. Nerida from Ellifont was the designer behind all our Invites and we brought this theme into our wedding day with signs and menus. Said Kimberely, when we inquired about her styling finesse. “She was the ONE – spectacular! I loved everything from the beading to the plunge and the skirt. WOW – all those layers, with the most amazing detail and train.” Kimberely said of her dream dress. 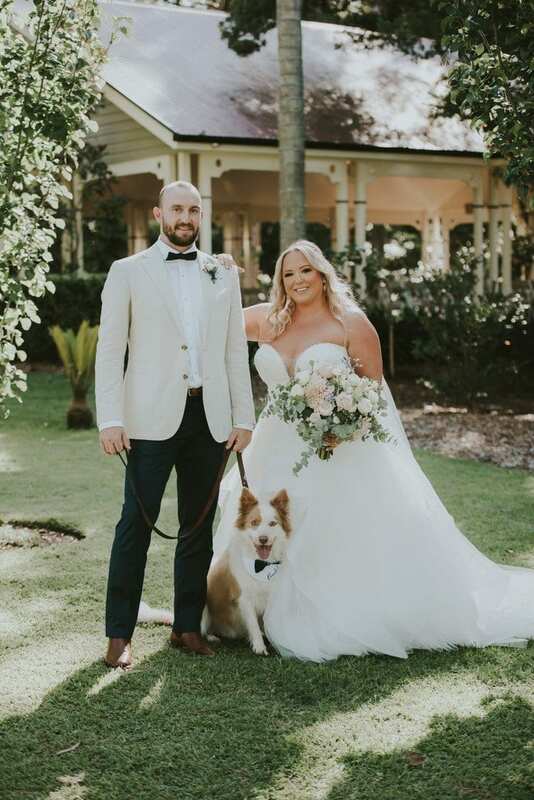 Our stylish bride continued her style into her bridesmaids gorgeous gowns – chic off-the-shoulder ivory dresses offset with groomsmen in a lovely light sand jacket and black trousers. Kimberely didn’t hesitate when we asked her what her favourite part of her big day was, and how could she? Could it get any cuter folks? We think not! Kimberely’s advice for future brides? “Create a vision either with a book or board.” Says Kimberely. “I bought a large Art book. I had so many magazines which I cut and pasted pages and pages of ideas and dreams. I sketched out my reception and tables with exactly how I wanted everything. I also had the most amazing Wedding Planning Folder from Ellifont – I cannot recommend this enough. Be organised and keep track of everything. It makes the last weeks so much easier leading into your big day.” She says. This gorgeous new husband and wife duo are set to travel to Europe in May to celebrate their honeymoon, starting in the ridiculously picturesque Kos in Greece before heading to Italy. See more from their big day down below!